A near future that sees an altered world, changed by flooding, climate change and terrorism. The biggest change however is by the arrival of the aliens who call themselves the Jackaroo. The Jackaroo seem to be Earths hope and salvation, saving it from itself. At last the question of whether we are alone in the universe is answered. Humanity is offered fifteen habitable planets where they can start afresh, available through wormholes in space aboard Jackaroo shuttles. Bits and pieces of ancient alien tech are eventually discovered on these worlds and before much longer some of this advanced tech is reverse engineered. Earth and many of its inhabitants become changed. It's the job of Chloe Millar to map such changes that are being caused by this "Elder" technology - not least the strange artefacts which seem to be haunted by the spirits of alien ghosts with their own minds, and their own agenda - just lacking the physical bodies to carry them out. Elsewhere on one of the gifted worlds, Vic Gayle investigates a murder that seems to be linked to a war between rival factions over an archaeological dig that may have uncovered old alien relics. 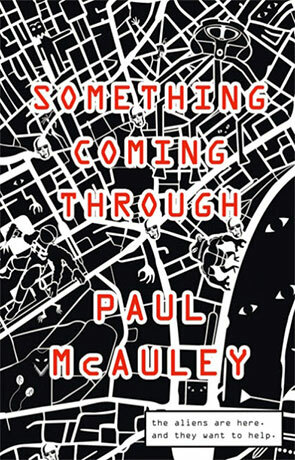 Every Paul McAuley novel is different but the difference with Something Coming Through seems more marked than usual. It's based on short stories in the "Jackaroo sequence" - which include "The Choice" — a short story that won the coveted Theodore Sturgeon Memorial Award in 2012. It's got a different feel to any novel he has written before and yet also feels uniquely McAuley at the same time. As ever the book is brimming full of imaginative ideas which combines well with a strong sense of mystery. Mystery about the Jackaroo, mystery about the alien artifacts (and Spirits) and mystery about what is going on with the antagonists. The latter forms into elements of a police procedural with thriller undertones. It all fits together wonderfully with chapters alternating between the investigation carried out by Chloe on Earth and by Vic on the distant planet. It's a different slant on the idea of first contact and one I've not read about before. The Jackaroo make suitably "alien" aliens - all mysterious and vague with seemingly hidden agendas that are just hinted at. On the surface they claim to just be wanting to see how "less advanced" races handle the gift of superior technology but I don't think any reader will buy that for a minute. Anyway Something Coming Through is science fiction at it's peak, its modern, clever, involving. It's got more ideas than a science fair and more mystery than Miss Marple. Wrap that all up in an original first contact story with some enigmatic aliens, even stranger ancient technology and some great characters and you have one hell of a book. Written on 23rd March 2015 by Ant.